Finally (! ), I was able to take photo´s during one of my courses again! It was already the third course this year and I hadn´t taken one photo yet, due to the restriction of the new privacy law. Yes, photo´s may be taken, but may not be used. It makes looking at or reading a piece about one of the course days just slightly more boring. After all, reading should also be easy on the eye. And, more importantly, a photo conveys the energy of that day. It lets you experience the vibration present during that day and I always consider that an added bonus. That´s why I was even more pleased to welcome Annemijn back as participant of the Healing Hands advanced course as she immediately started to Instagram about it. Right up the alley of my writer´s heart! By the way, Annemijn has a good nose for great days, because the last time she participated in one of my courses, was in the South of France! The day started off being wonderful: first some cheerful grape hyacinths from a sweet participant and after that, a gorgeous bouquet of flowers from an equally sweet participant! We then moved on with the course and with energy business as usual. The theme of the day was the nervous system and its overstimulation (for example resulting from burnout, HSP, adhd and/or autism) and it turned out to be a very special day. To begin with: several participants had been sick the week before. They had been doing some of the work up front, thereby being perfect to practice on. And…they noticeably recuperated as we worked during the course of the day. Proof of good work. We covered quite a large amount of theory, in which I explained the relation between nerves, certain areas of the brain and relevant chakras. 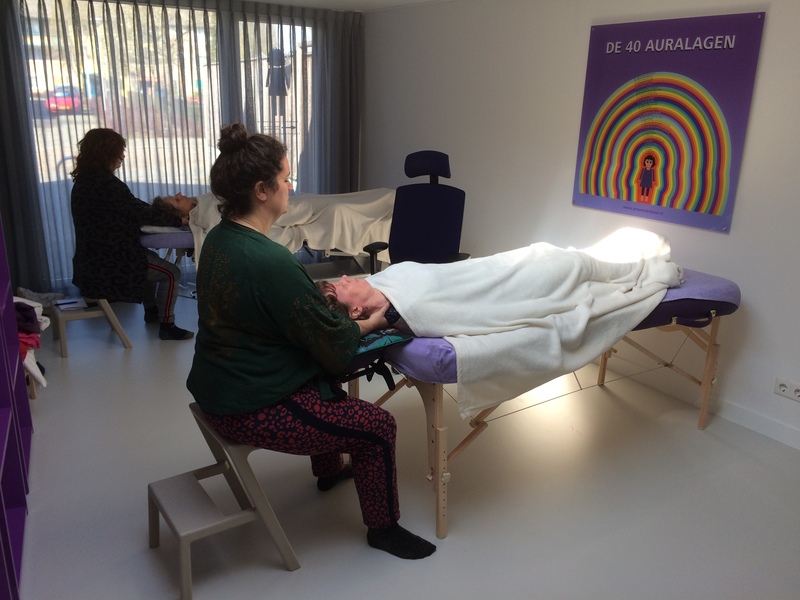 We discussed treatment and work methods, both in the physical body and in the aura, and I gave guidelines for tackling specific disorders. Then it was time for supervised healing and the space became a wonderful, peaceful oasis! Everyone worked really hard and mostly in silence allowing all the healers to focus exclusively on perceiving and discerning all the subtle impulses. Which is, of course, really important when in the process of healing the brain. 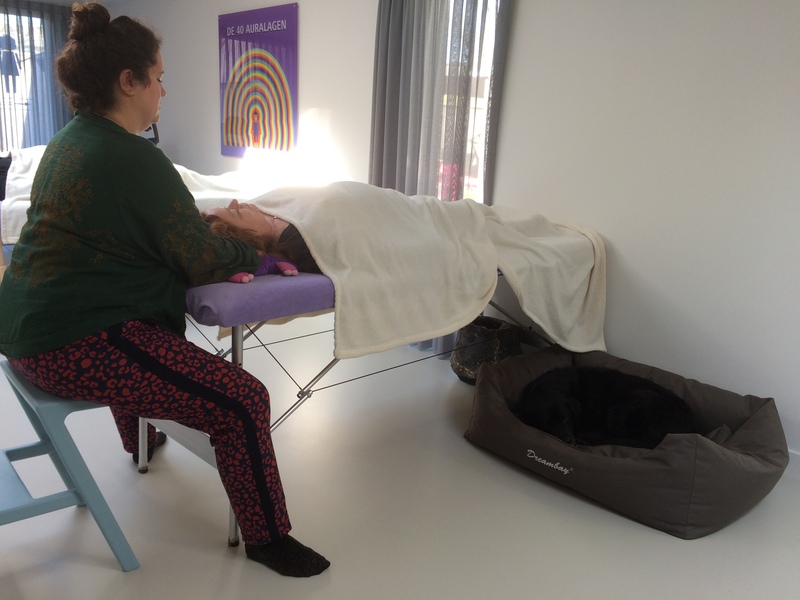 And, during the course of the healings, everyone – the test client and the healer, Senna, my doggy child – became more relaxed and calmer. Wonderful! I saw lines disappear from faces and felt the tension eb away from jaws, lower backs, pelvises and some other places. All this as a result of neutralizing the overload of impulses in the nervous system. 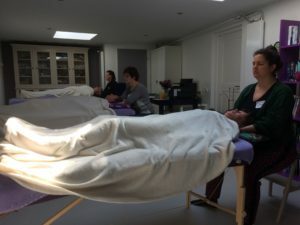 Deeply relaxed everyone said goodbye and a few of the participants discovered that they would see each other again during the next Healing Hands Advanced course in June. The theme of this course is ‘the stomach and the obstructive role that food plays: food allergies and eating away emotions’. Another fun day to look forward to and I’m curious as to the effect of lunch that day. If you were hoping to register for this course, unfortunately it’s already full. But you can still join the group for the Advanced course on the 11th of October with the theme ‘the reproductive system and the power of creation’. Please register via my website.